By now, you’ve probably heard that sugar isn’t great for your waistline, your blood sugar or your long term health. With more information surfacing daily about the dangers of excess sugar, artificial sweeteners have staked their claim in the media as a “healthier” alternative. Artificial sweeteners are found in a wide variety of popular products, including but not limited to diet sodas, gum, yogurt, breads, energy bars, protein powders, and low-sugar or sugar-free versions of ice cream and other baked goods. Without the added calories from real sugar, artificial sweeteners may sound like an enticing solution to a rapidly expanding obesity problem. However, current research on artificial sweeteners suggests that these replacements may be just as harmful to your health as regular sugar. In fact, artificial sweeteners have been linked to certain cancers, heart disease and surprisingly, weight gain. There are six FDA approved artificial sweeteners on the market: acesulfame-potassium, aspartame, neotame, saccharin, advantame and sucralose. 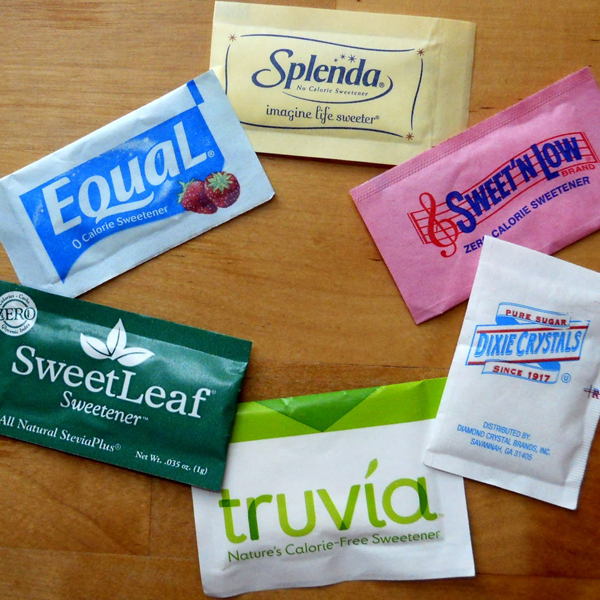 These sweeteners are more commonly known as Sweet’N Low, Equal, and Splenda. They are most recognizable in the little pink, blue and yellow packets that sweeten your coffee, but they are also hidden in a vast number of popular processed foods. Currently, three of the most common artificial sweeteners (acesulfame-potassium, aspartame, and saccharin) are in the “Avoid” category for the Center for Science in the Public Interest (CSPI). The CSPI suggests that these sweeteners are “unsafe in amounts consumed or very poorly tested and not worth any risk”. Aspartame (i.e. Equal and NutraSweet) was banned by the FDA in the 1980s due to research that suggested it may contribute to the development of brain tumors. Although it is no longer banned, a number of studies in the past two decades have demonstrated an association between aspartame and several types of cancer. A recent study by the University of Iowa also concluded that women who consume 2 or more diet drinks sweetened with aspartame are 30 percent more likely to have a cardiovascular event (heart attack or stroke) and 50 percent more likely to die from that disease. Furthermore, although they do not contain calories, preliminary research has shown that artificial sweeteners may actually lead to weight gain. The CSPI reports that artificial sweeteners may be linked to obesity and weight gain as a result of the way they interact with essential gut bacteria. Changes in gut bacteria are linked with the ability to absorb nutrients and may impact hormonal balance, specifically leptin, a hormone that controls how much we eat. Recently, there has been a move towards natural, no calorie sweeteners in place of chemically altered artificial sweeteners. Stevia, in particular, dominates the natural sweetener marketplace. Stevia is a plant-derived sweetener that is naturally sugar-free and 200 times sweeter than regular sugar. Stevia is safe to consume and does not increase blood sugar. Similarly, Truvia is another Stevia-based sweetener that can be purchased in packets to be used in place of unhealthy artificial sweeteners like Splenda or Sweet’N Low. Truvia, developed by The Coca-Cola Company and Cargill, contains stevia extract and erythritol, a naturally-derived sugar alcohol. Stevia and truvia are increasingly popular sugar substitutes, most commonly used in drinks, including the new Coca-Cola Life and Pepsi True. Both are stevia sweetened, reduced-calorie versions of regular Coke and Pepsi. Sugar alcohols (xylitol, erythritol, lactitol, maltitol, mannitol, sorbitol) are also present in a number of “sugar free” food products, as they naturally contain no calories. Some sugar alcohols are found naturally in fruits and vegetables, while others are industrially processed from other sugars. There is no existing evidence that sugar alcohols cause serious long-term health problems. However, most sugar alcohols are poorly digested by the body and cause bloating and other intestinal distress. GI distress can be very disruptive to your on-the-go lifestyle, especially when you are traveling for hours or putting in a long day on the basketball court. Bottom line: there is not enough conclusive research to determine the precise long term effects of artificial sweeteners. So far, most scientific feedback regarding artificial sweeteners is negative and there are many potentially serious dangers to your health. Is it truly worth the risk? Making some easy swaps to healthier, naturally sweetened foods may have short and long term payoff for the maintenance of your health. Try Bai Bubbles, a carbonated, 5 calorie beverage that is sweetened with erythritol and stevia. Bai also contains organic coffee fruit extract for a small dose of natural caffeine. With seven different flavors and the same satisfying carbonation, you won’t miss your old diet beverage. -Instead of Crystal Light Natural Lemonade (contains aspartame)…. Try COCO5 Limon, a 100% all natural flavored coconut water developed by sports nutritionists. It contains no chemical additives, dyes or high fructose corn syrup and has many naturally occurring electrolytes to keep you well-hydrated. Try Siggi’s Vanilla Icelandic Yogurt, a protein-rich (14g per serving) yogurt sweetened with organic agave nectar. With little sugar and plenty of protein, this is a far more satisfying snack choice that will positively impact your health. Try Kind Almond Walnut Macadamia with Peanuts + Protein, an all-natural, non-gmo bar made with a variety of nuts and sweetened with honey. Your body will thank you for providing it with natural fuel that provides long lasting energy and healthy fats that stabilize blood sugar levels. Try So Delicious Dairy Free Coconut Milk Creamer, a low calorie, allergen-free creamer with only 1 gram of sugar and no artificial sweeteners. A small dash of this rich coconut creamer will provide plenty of sweetness in your morning cup of joe. Always remember to read your labels and look for potentially dangerous ingredients that may be hiding in your food. Making small, easy swaps is the first step towards improving your health and ensuring that your body receives the nutrition it needs to keep you on your feet. 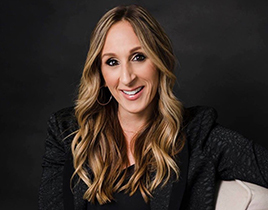 Written by Stacy Goldberg, Official Nutritionist for the NBA Coaches Association, and Lexi Sinclair, Content and Blog Editor at Savorfull. Lexi is a Senior English Major at Amherst College. Any questions or want specific suggestions?